Throughout this history of timepieces, clocks have bee painted and decorated as an added element of design. Generally, the painting reflected the style or idiom typical of that era. With that in mind, I asked Carol Bass, a noted Maine abstract painter to clothe one of my clocks with one of her canvases. 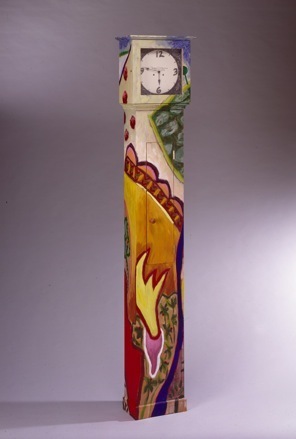 She paints large, colorful, expressionistic pieces and she has wrapped this particular New England Tall Clock in such a painting. This timepiece is one of several that I have had painted over the years and remains a personal favorite. In fact, it was such a favorite that both it and the artist live with me here on Edisto Island. The case of this clock is made of solid maple and cherry and encompasses all the joinery techniques of my New England Tall Clocks. It is painted on all surfaces, including the back and inside. In some instances, the interior of the clock is as intriguing as the exterior.